Keynotes? Conferences? Library and bookstore events? Sure! Michelle speaks to both children and adults about the writing process, Dottie Kamenshek and the AAGPBL, Emma “Grandma” Gatewood who was the first woman to solo hike the Appalachian Trail, the life and art of Charley Harper, rural living, raising readers, and about her 1894 schoolhouse restoration project. Fees vary depending upon location and type of group. See a list of Michelle’s previous speaking engagements at the bottom of this page. Contact Michelle directly to schedule. I hear Michelle teaches workshops for other writers. Absolutely. From “what I wish someone had told me ten years ago” to “let’s take a look at this manuscript,” Michelle enjoys supporting other writers. January 26, 2019 – Writing for Children: Where do I begin? One-day workshop held in rural Celina, Ohio. Not a craft workshop, but a day spent answering all the questions of the business end of writing. How do I know if what I’ve written (or want to write) is good? Where do I find a publisher? Do I need an agent? 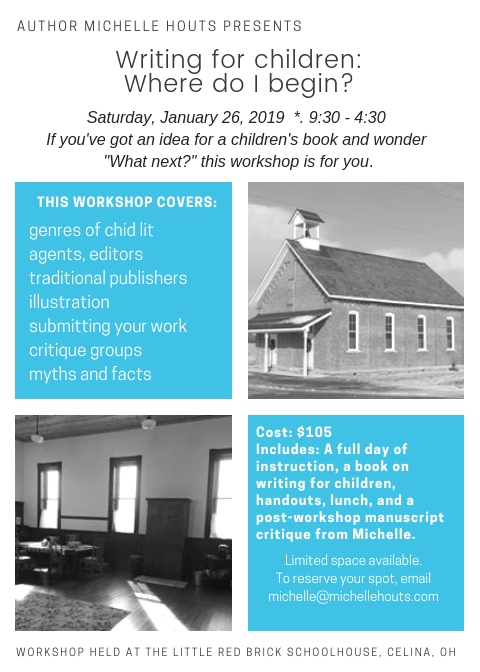 Cost includes a full day of instruction, lunch, one of the best books in the industry about publishing children’s books, and a manuscript critique from Michelle after the event. Space is limited. Email Michelle for more information or to get a registration form. Is Michelle for hire for manuscript critiques? Currently, Michelle is only critiquing for those who attend her workshops (included in the workshop fee is one critique) and for those in the two writing groups to which she belongs. For more information about where to find readers and critique partners, visit www.scbwi.org.